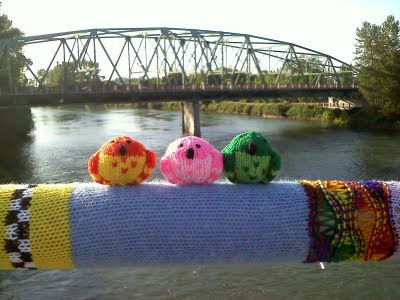 This year held the first annual International Yarn Bombing Day on June 11, 2011. 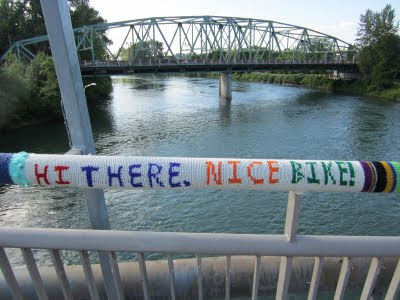 My knitting group, the Eugene Knotty Knitters decided to yarn bomb a bicycle and pedestrian bridge in Eugene, Oregon. There were so many great pieces. I've said it before, but I am in so much love with my crafty friends. Their art is so inspiring! You can read more about our yarn bombing at The Knotty Knitters blog. 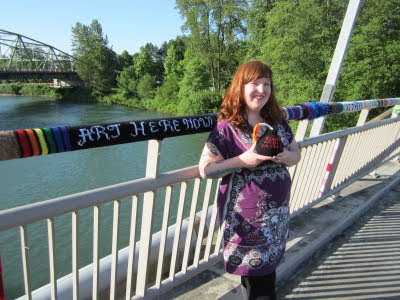 And I was a guest blogger for Yarnbombing.com. 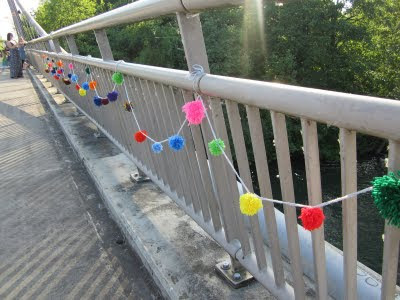 My contributions to the bridge were a few railing cozies, a pom pom garland and a loooooooong cozy for the bridge that measured 42 feet. After we added the other cozies, it was over 50 feet in length. Amazing! I LOVE LOVE LOVE your yarnbombing, and I sent a link to my daughter who lives there. The birds made me SMILE!